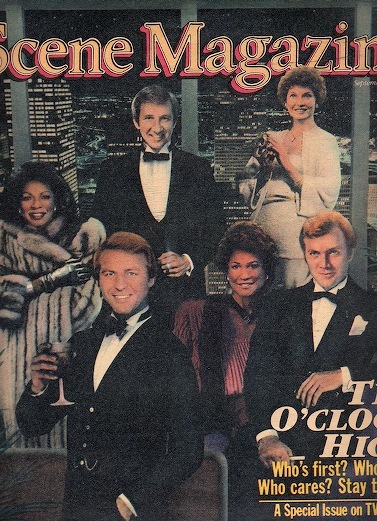 Former KXAS-TV anchor Dave Layman (front and center with drink in hand) was grouped with D-FW's fellow 6 and 10 p.m. anchor heavyweights in a Sept. 27, 1981 Scene Magazine article written by yours truly. Also pictured are Iola Johnson, Tracy Rowlett, Jane Jayroe (upper), Clarice Tinsley and Chip Moody (lower). Note to readers: D-FW's featured 6 and 10 p.m. weekday news anchors mostly do just that -- anchor. They're rarely seen "in the field," unless it's at a speaking engagement or the Texas State Fair. We have to rewind more than a quarter-century to find the market's last bonafide day-to-day anchor/reporter. Dave Layman paid a price for that, lasting less than two years at KXAS-TV (Channel 5) long before it was bought by NBC. This story, originally published on May 20, 1982 and headlined "Dave Layman believes he's a reporter first," documents how and why he didn't survive long-term with co-anchor and former Miss America Jane Jayroe. Dave Layman, Channel 5's newly deposed news anchor, has his heart in the right place, all right. But he also wears one on his sleeve, and this tends to diminish his stature on the air. Layman often comes off as a middleweight competing against the polished performances of his competitors, Channel 4's Chip Moody and Channel 8's Tracy Rowlett. With Layman, "there was just something missing," said Channel 5 news director Bill Vance. "Boy, I wish the heck I could define it." Layman was told to look for other work Wednesday after 20 months of teaming with Jane Jayroe on Channel 5's 6 and 10 p.m. weekday newscasts. He'll remain on the air for a while, until station management finds a "suitable replacement." Channel 5 staffers got the word about Layman in a memorandum posted by management. Layman then distributed his own memo, in which he said thanks for the memories and keep up the good work. "I thought it was a pretty classy thing to do," a Channel 5 reporter said of Layman's note. "I think a lot of people feel bad about his going, because you won't find anybody who cares more than Dave or who tries harder." Too hard, it often seemed when watching him anchor newscasts. Layman oozed enthusiasm, but frequently lacked presence. "Sometimes he got hung up in the field too long and ended up pushing himself against the clock," Vance said. "Then he wouldn't have time to go over his script adequately." Layman, 37, is as earnest as they come and a prototype workaholic. As a boy he had a severe stuttering problem that he overcame on his own. Maybe that has something to do with his relentless determination to do it all at Channel 5: anchor, reporter and host of the Layman & Co. public affairs show, too. Not in that order, though. "It was reporting, Layman & Co. and then anchoring," a Channel 5 staffer said. "Anchoring came last for him -- and that was part of the problem." Layman still thinks he has the solution. "There's no reason in the world," he said, "why an anchor can't get out there on the street. I don't think what happened to me is any kind of indictment that says you can't be both a reporter and an anchor. I'll be disappointed if Channel 5 changes its policy on that, but they may want somebody who wasn't quite as eager as I was about it." Layman said his plans are to go on to an even larger television market (Dallas-Fort Worth is the 10th largest) and be an anchor/reporter again. "You absolutely can do both," he maintained, "and the challenge is to do both of them well. The problem is that most anchors don't want to be bothered with reporting. And I think that's a mistake. I'm going to take this situation and turn it into another positive one. I'm not crazy enough to say 'New York, here I come.' But I'm proud of what I did here. These have been the two best years of my professional life." A veteran Channel 5 staffer thinks Layman eventually will have to realize what seems to be the error of his ways. "I don't think there's any way in hell he can do both -- unless he goes to a smaller market," the staffer said. Vance said a good anchor by nature also should be a good reporter. But he left little doubt that Layman's replacement will be more of a news reader. "I would like to have someone who has the reporting capability," Vance said. "But the number one function of the job is to anchor, so that's going to be the number one prerequisite." The anchor-reporter is a dinosaur in large television markets. To maintain an illusion of sorts, most big-time anchors are expected to dabble in reporting on occasion. It looks especially nice during ratings "sweeps" periods if the anchors put on a command performance in the field. Some of these anchors in fact can report and did it for years before going behind a desk. Others never cared much for the idea of getting sweaty and mussed up "on the street." Layman wore his sweat like a badge of honor. Knowing he wouldn't change, Channel 5 management tried to make the best of Layman's doggedness by portraying him as a whirlwind reporter in touch with the community. Seldom does hype hit the truth on the head. In his case, whammo. Last summer, Layman was interviewed at length as part of an up-close look at this market's six major TV news anchors. Layman was late for the interview because he had been out on a story. He arrived in a sweat and had to force himself to sit down. And then the arms waved every which way while the words spilled out like a running faucet. "Maybe sometimes I try to take on too much," he conceded. "But the more you push yourself, it seems, the better you do. I feel so strongly about going out there and reporting that sometimes I come back and my anchoring does suffer for it. There are some nights I leave here wanting to go out and slash my own tires because I tried so hard that day and left a lot of people with a bad feeling about the show. I stumbled through a few pieces of news copy and wasn't prepared. You end up giving 150 percent and you still feel like . . . It's not fair." To the average viewer, Layman wasn't cutting it as an anchor. At least that's what Channel 5's latest research report said. Like almost every television station in a major market, Channel 5 retains a consulting firm to advise management on how to program the news. The consultant at Channel 5 is Frank N. Magid Associates, headed by one of the founding fathers of "happy talk." Based in Cedar Rapids, Iowa, Magid has been in the news consulting business for 12 years. Lots of anchors have come and gone at his firm's request. "The research in essence confirmed what we were seeing ourselves. There was just something missing," Vance said. Vance and Layman go back to the days when the latter was a reporter doing "cut-ins" for local segments of NBC's Today. Vance was Layman's boss at TV stations in Providence, R.I. and Columbus, Ohio. The third time in Dallas-Fort Worth wasn't a charm. "In a sense, I discovered Dave Layman," Vance said. "So it was an especially difficult decision for me to tell him things weren't working out." Layman was teamed with Jayroe in July, 1980. He replaced Moody, who left Channel 5 after almost 10 years to join Channel 4. Arbitron and Nielsen numbers for the latest ratings period, the February 1982 "sweeps," put Channel 5 last at both 6 and 10 p.m. The average rating for Channel 5 has dropped slightly from 12.75 in October 1980 (the first measurement of the new team's drawing power) to the present 12.5. No improvement in the ratings and no vote of confidence from the consulting firm meant Layman's number was up. "If I don't write stories or report for a newscast, I'm a crummy anchor," Layman once said. "I feel like I'm a parrot, an idiot. You can't call me anything worse than a 'news reader.' To me it's the worst thing in the world, because it means an anchor didn't do anything for the newscast except just show up." Layman did far more than just show up. And that's more or less why he'll be moving on -- again.